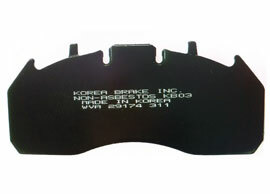 Korea Brake’s pads are designed for commercial vehicles. They can be applied to all vehicles. Each mechanical shear pad backing plates has an MVA number and batch code for full traceability and Triple Protection. An integral steel mesh, stud welded to the backing plate, through and around where the friction material flows. When the friction material is cured the mechanical shear strength is greatly enhanced. The backing plate is coated with thermo setting phenolic adhesive. This delivers the industry standard bond of the friction material to the backing plate. This bond has a strong resistance to thermal stress. The best compound for brake performance may not be the best compound for bonding. In order to ensure perfect bond conditions we insert an ‘interlayer’ of material specifically formulated for bonding between the backing plate and the main friction material block. During molding and curing this interlayer flows and fuses organically into the main friction on block and adheres perfectly to the backing plate and steel mesh. As a result, the final bond is fully secure. Filed Under: KOTRA Tagged With: backing plate, Brake pads for cvs, commercial vehicles, integral steel mesh, Korea Brakes.Corp.